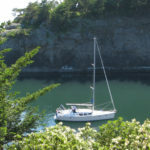 Whether we are sharing the San Juan Islands with our guests for three days or a week, our first stop is usually Sucia Island. Because it is not one of the main islands serviced by the ferry system and thereby only accessible by private boat, this “crown jewel of the state’s marine park system” often slips under the radar. 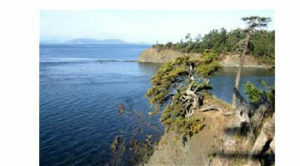 Sucia Island’s name originated with the Spanish Captain Francisco de Eliza, and can be found on maps dating to 1791. He named it “Isla Sucia”. 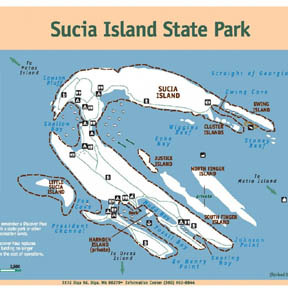 (Sucia in Spanish means “dirty” or in a nautical sense “foul”, in this case referencing the dangerous reefs and hidden rocks that dot the entrance to its bays). From an aerial view, Sucia has the form of a hand with fingers. This unusual shape is a result of the unique way in which the island was formed, may millions of years ago. Geologically, it’s a very different place than the rest of the islands in the San Juan archipelago. Most of the San Juans are comprised of a submerged mountain range – dense, black granite characterized by cliff faces, steep hills, and craggy outcroppings. Sucia is an ancient, uplifted seafloor and riverbed. There are areas where you can observe where the rock patterns have “folded” over the eons. A bit of trivia: Washington State’s very first dinosaur bone, dated to 80 million years ago, was discovered on the shores of Sucia Island in 2012! 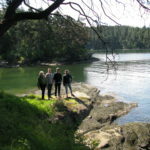 Sucia Island State Park is a 564-acre marine park with nearly 15 miles of shoreline and features 10 miles of well-maintained hiking trails. Because of the unique shape of the island, most of these trails hug the coast and offer breathtaking views of the rugged shoreline and odds are good that you will see seals, sea lions, and a wide variety of birds. 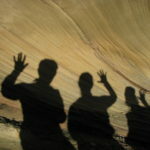 Be sure to wander around the shorelines, where you will find unique honeycomb formations in the sandstone. The island shape also creates the many natural harbors popular with boaters. These include Echo Bay, Shallow Bay, Snoring Bay, Fossil Bay, Fox Cove, & Ewing Cove on the east end of the island. The cluster of Sucia Islands was purchased in 1960 by the Puget Sound Interclub Association and later donated to the State of Washington for protection as a Marine State Park. With the exception of a rangers’ cabin and a couple of vehicles for park service use, there is no residents or facilities on the island. With camp sites at various spots across the island, Sucia is popular for camping during the summer months. But even on popular weekends you can still feel you have the island mostly to yourself!